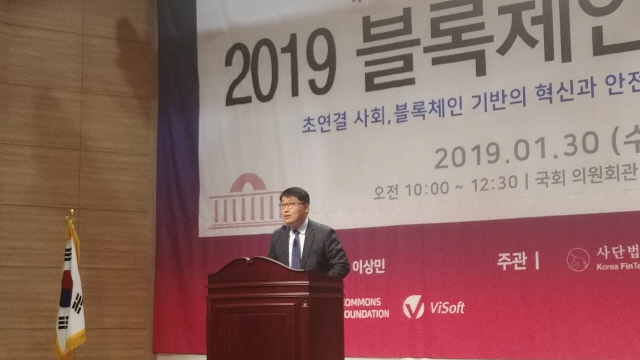 Delivering a congratulatory speech in a blockchain conference held at the National Assembly Wednesday, Kim Tae-gyun, director-general of the smart city policy bureau at Seoul City, expressed the city’s willingness to apply blockchain to the municipal government’s administration again. Seoul City had declared the blockchain-powered innovation of administrative services through its “blueprint for blockchain city Seoul (2018-2022)” last October. The blueprint called for Seoul City to take the lead in building a blockchain ecosystem by promoting the blockchain industry over five years. Its major projects included creating blockchain complexes, supporting corporate growth, nurturing 760 experts, promoting the MICE (meetings, incentives, conferencing and exhibitions) industry and reinforcing the private-public cooperation. To help stimulate the blockchain ecosystem, in particular, two blockchain complexes will be built in Gaepo Digital Innovation Park and Mapo Seoul Startup Hub to accommodate 200 companies. Seoul City plans to create bases for 23 startups and mid-sized companies in Mapo Seoul Startup Hub (600 square meters) and those for 50 firms in Gaepo Digital Innovation Park (2,325 square meters) by the end of this year by utilizing existing spaces. “We are pushing for a plan to build complexes where developers converge. The foundation for this plan will begin soon,” Kim said. Blockchain will be exploited actively for administrative services. M-voting, a mobile voting system intended to experiment with direct democracy participated in by citizens, will also make debut soon. In addition, blockchain will be applied to the city’s 14 leading projects to ensure the innovation of public services directly related to citizens’ lives.